There is a familiar feeling about today, as economic woes have clobbered the Chinese stock market overnight (hark, down 6.2%). Heavy selling ensued into the close, as a seeming lack of government intervention to support the market (?!) stoked concerns, and ergo, voracious selling. Nearly three-fifths of stocks finished limit down (-10%). There appears to be three consistent themes in global financial markets at the moment: China worries, currency routs, and commodity sell-offs. We can tick all three of these boxes today, as WTI continues to retest 6-year lows, while copper and aluminum join its pity party. Back to black gold, Texas tea, and the tone for the day has been set by the overnight sell-off in Chinese equities, although prices are trying to pare losses. In terms of economic data flow, inflation data came in slightly above consensus in the UK, keeping the British economy neck-and-neck with the U.S. in terms of interest rate hike expectations. U.S. housing starts were just released, and hit their highest rate since 2007. We get the weekly API inventory numbers out later this afternoon to bring focus back onto U.S. fundamentals. 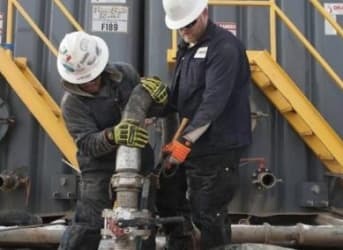 The mottled picture for U.S. production continues, as North Dakota surpassed a milestone in June, having drilled its 10,000th shale oil well. While EIA projections for September point to falling production from the Bakken, the North Dakota Division of Minerals reports June’s crude oil output increased to 1.21 million barrels per day, up 0.7% over May.